There’s a lot of dystopian fiction out there. We see it in fantasy. We see it in SF. We see it on tv. Some of it is fabulous. But having looked at and read dark non-realist fiction for at least 30 years, I think I’m ready for something else. That something else can be glimpsed in Secret Garden, the magical-realism inflected Korean drama that I spoke of in a recent post. It can be glimpsed in the hijinks of the post-humans in Adventure Time. It can be glimpsed in Moonrise Kingdom. It can even be seen between the slow-moving spokes of that surreally lyrical cyclist anime – Yowamushi Pedal. That sweet strange alternative universe is connected – as most stories that we tell are – to an old form, that in European lit, is called “the pastoral.” The pastoral is linked to both comedy and romance, and it features people cavorting in a natural setting, contemplating nature, frolicking, love-making, and — yes – camping in a world that is not always friendly, but where a natural order — a cosmic harmony if you will – eventually prevails. I’ve been thinking a lot about the pastoral in my own writing. These days I’m wondering if the most radical imaginary thinking we can do these days is utopian thinking as a way towards addressing our daunting difficulties. A kind of magical realist answer to GOOD Magazine. 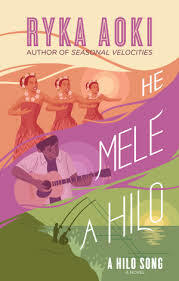 Enter Ryka Aoki’s playful, brilliant, accessible and totally delectable novel, He Mele A Hilo. Wait a minute, you say. Ryka Aoki’s a poet, isn’t she? Hey, and isn’t she a gender activist? Um, so isn’t this novel going to be really heavy and political and deep? Well, your partly right. It’s political and deep. But it’s light. It’s delightful; it’s frothy; it’s fun. It’s about hula, and Hawaii, and who gets to be Hawaiian, and what identity and tradition and history mean. It’s got hula dancers of different shapes, colors and hybridities, fast food makers, a billionaire and his wife, gods and spirits, and unending tasty chicken. Also music. Also wonderful uses of pidgin with a glossary at the back if you need it (which you won’t). Do you need something lovely to read? Sure — Who doesn’t these days? Please please please treat yourself to a lunchplate full of imagery and humor and joy. After you read it, please let’s talk story about it in the comments below. 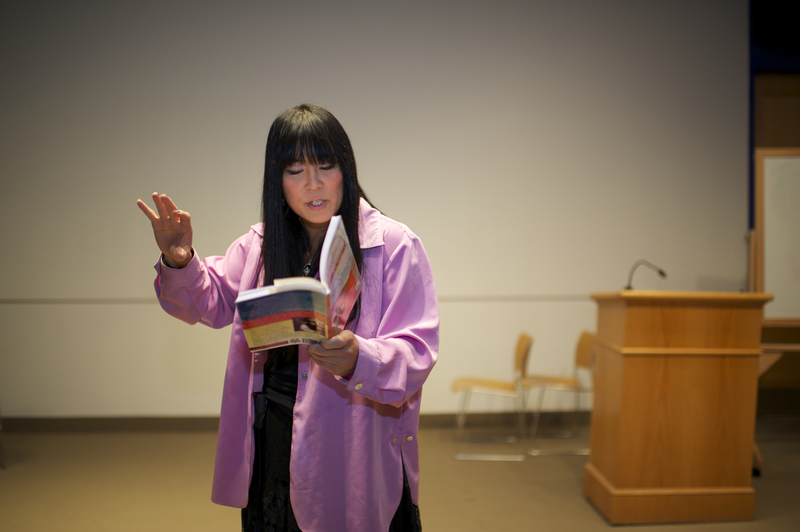 SYRACUSE, NY – Transgender writer, performer, and educator, professor of English at Santa Monica College, Ryka Aoki gives a speech at Watson Theater of Syracuse University on Apr. 9, 2012. She dedicates to transgender, genderqueer, and intersex group. PS — To learn more about Ryka and why she writes click on this lovely article from Publishers Weekly.